The Gone Fishin’ Portfolio offers a framework for saving, sound investment wisdom and no less important a step by step approach to their practical application up to a detailed asset allocation. When I read through the first couple of chapters of The Gone Fishin’ Portfolio by Alex Green I was surprised to find a philosophical reference to Plato’s Apology and the Socratic Method. One of the bases of western philosophy, the Socratic Method dictates the constant inquiry of premises and assumptions and encourages an oppositional discussion as a path to knowledge. The Socratic Method is therefore a double-edged sword the author may end up facing himself. That was not the case. As the story goes the Oracle of Delphi pointed Socrates out as the wisest of men (and women). Socrates, thinking it a paradox, set out to prove the Oracle wrong and turned to the wisest of Athenians who surely held knowledge that surpassed his own. Using his famous Socratic Method Socrates revealed none of these wise persons really held true knowledge as all failed to explain their concepts of truth, justice, good, beauty and happiness. Socrates found the oracle to be right as he was the only one aware of his ignorance, paradoxically making him the wisest of Athenians (He simply knew he didn’t know). The author makes an equally strong argument when it comes to investing and managing our money. The lesson Socrates had taught the world is a powerful and important one and when it comes to investing it seems we sometimes need a reminder. An author that advocates skepticism at the start of his book has already earned considerable credit in my eyes. What is The Gone Fishin’ Portfolio about exactly? As aforementioned, much like Socrates, the author lays no claim to knowledge that is not available or is out of reach for all of us. The author quickly lays bare the claims of Wall-Street to “professional knowledge” which we, household investors lack. The case against professional money management is a bit strong, even demagogic at points but is essential for the author’s main point. Managing our money isn’t as complicated as other may want us to think. 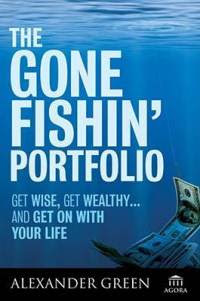 The Gone Fishin’ Portfolio is a book aimed at the household investor surrounded by never ending piles of knowledge leaving him (or her) even more confused and baffled. The book offers a simple and robust investment strategy that has proved itself over the long haul. Much like Socrates and his paradox the author does not claim to hold knowledge of any special investment strategy which will enable us all to generate phantasmal abnormal returns. You will find no secrets to timing the market as there are none and you will be disappointed if you’re looking for a safe riskless investment strategy that will generate return out of thin air (again, there is none). The author simply turns to old investment wisdom that relies on the basics of finance. Long term investing, diversification, varying levels of correlation and wise asset allocation are fundamental to the approach offered by the author. That is also possibly the book’s main shortfall. The book lacks in innovation but most certainly makes up for it in sound investment advice. The book offers a specific portfolio and is aimed at the majority of household investors who wish to wisely invest their savings and spend as little time as possible maintaining them (which is, by the way, great advice for long term investors). The portfolio offered by the author is a sound one and is allocated very much accordingly to the text book. The book offers more than just a portfolio. It offers a framework for those of us who seek a comfortable retirement and wish to balance the risk of a financial shortfall with the risk inherent to financial investments. It points out the conflicting interests many money managers face when dealing with out savings and sheds light on various financial truths with historical evidence. I believe The Gone Fishin’ Portfolio serves as a good financial education book and I would recommend it to those of us who are less proficient in finance and investments and are taking their first or second step in the saving world. For the more proficient of us who understand good asset allocation, the CAPM model, the importance of long term investing and discipline and the crucial difference between investing and trading this book might serve as a good reminder of the basics. The book is well written even if a bit simplistic at some places. The author effectively repeats and stresses the main points brought forth and conveniently sums the essence of every chapter at the end. What would Socrates ask after reading The Gone Fishin’ Portfolio? As the Socratic Method dictates I’d question two main issues. The first one is the level of risk offered in the portfolio. The author suggests a very detailed portfolio which comfortably enough leaves only with the buy command and yearly maintenance, which is really a breeze. The asset allocation offered is relatively aggressive with 70% stocks in the portfolio. That is very important for long term savers. Arguably, as the term of investment shortens it is important to consider the level of risk taken (read Long Term Investments Are Not Risk Free for more on the subject). The second thing I’d question is the array of Vanguard mutual funds recommended. The author recommends, very wisely and objectively, to invest in index funds which are less costly in commissions when compared with managed mutual funds which have not proved to outperform the markets (on average, it’s actually the other way around). The author recommends Vanguard funds in terms of cost effectiveness. I’d test this premise before investing but the concept of the portfolio is true enough. The Gone Fishin’ Portfolio apparently outperformed the S&P for the last 5 years but that is not something to take for granted (that is do not assume it will continue to do so in the future, as the author points out). Naturally the author does not promise the portfolio will outperform the S&P every year and he very well shouldn’t. The strength of the Gone Fishin’ Portfolio is in its utilization of basic investment wisdom of long term asset allocation and rebalancing which has proved itself in the past (read Know your Portfolio – Three Simple Charts Can Make a World of Difference for more on the subject). Disclosure: Book reviews on The Personal Financier are entirely objective and are not paid for or sponsored in any way by the author, publisher or any other third party. The Personal Financier receives a 4% share of books sales referred by us which help support the efforts on this blog.